After a cagey opening period against Roma, Liverpool were again blistering in attack and Mo Salah again shone in a thrilling 5-2 victory over Barcelona’s conquerors. As abject and short on ideas as the Italian giants were, the Reds were rampant, overpowering their visitors with constant pressing, desire and tempo, ruthlessly exploiting the space available on the flanks. Salah, with two goals and two assists, will again attract the headlines in pursuit of Ian Rush’s 47 goals, the record number of strikes in Liverpool history, but it is the selfless work of Roberto Firmino that makes it all possible. Firmino, valued at £45m by Transfermarkt, is the complete modern striker. He can run in behind, but also came short to occupy Roma’s back three last night and his work-rate is one major reason that Salah can get away with playing as a second striker. Against the Italians, the Brazilian forward also netted two and made two from five key passes and shots apiece. His pace also frightened the visitors, embarking on four dribbles as Liverpool petrified their opponents, who were unable to muster a response until late on. 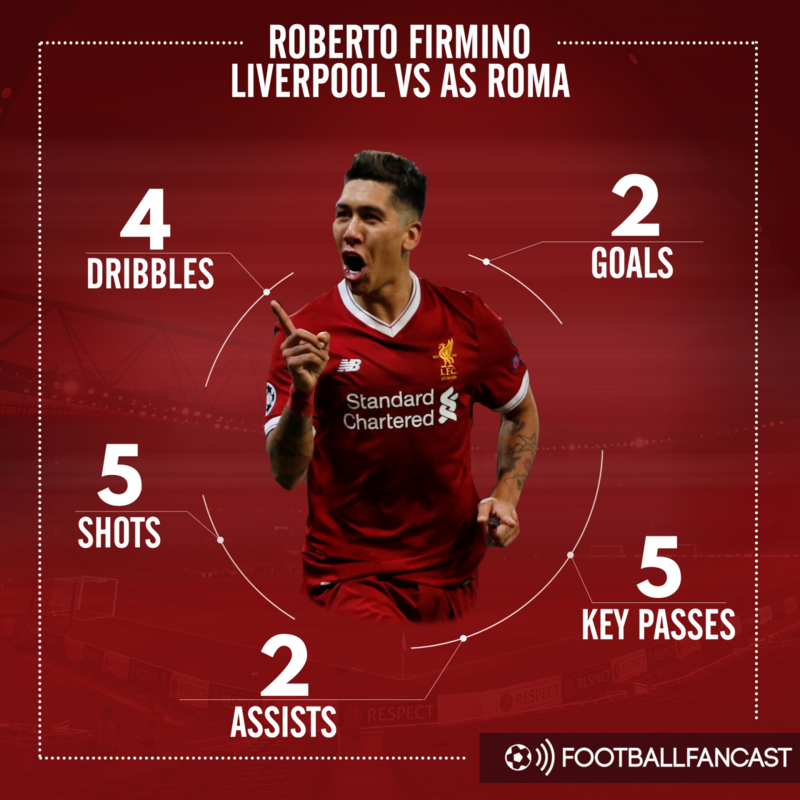 Roma’s comeback win against Barcelona and two late away goals adds a smidgen of drama and intrigue to the second leg but Liverpool’s attack should be good enough to secure a place in the final. That is down to Firmino as much as Salah.